A dramatic day with the Meynell and South Staffordshire Hunt today. 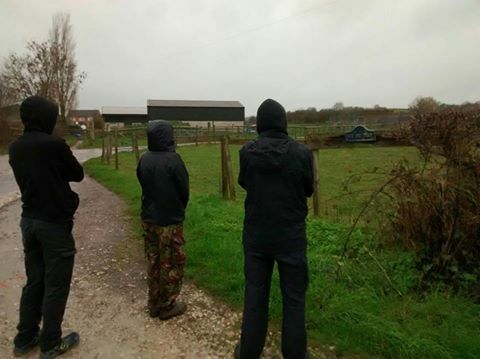 With help from our friends at Manchester Hunt Sabs we braved the cold, windy, wet weather to attend the meet at Forest Gate Farm in Marchington, Staffordshire. 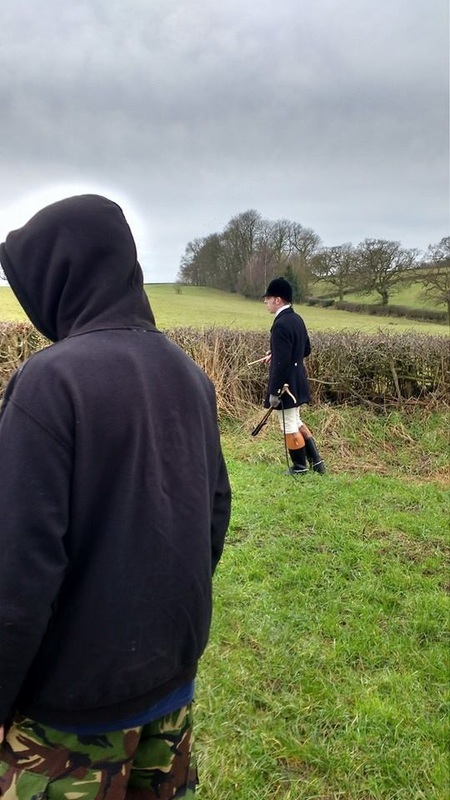 The hunt hadn't been out long when they picked up their first scent, but sabs were in position to pull the hounds off despite a local farmer threatening to get a shotgun on them. The hunt went back and forth over the same land, trying to pick up the scent again and succeeding until sabs once again intervened. Eventually the hunt were forced to move to another wood, where men on quad bikes drove at sabs trying to run them down. No one was hurt and we carried on following, repeatedly met with threats and general childish behaviour from the hunt supporters. The hunt kept quiet for a while, but towards the end started to pick up again and were again going back and forth trying to re-find the scent when they'd lost it in a way no one could ever believe to be a trail. 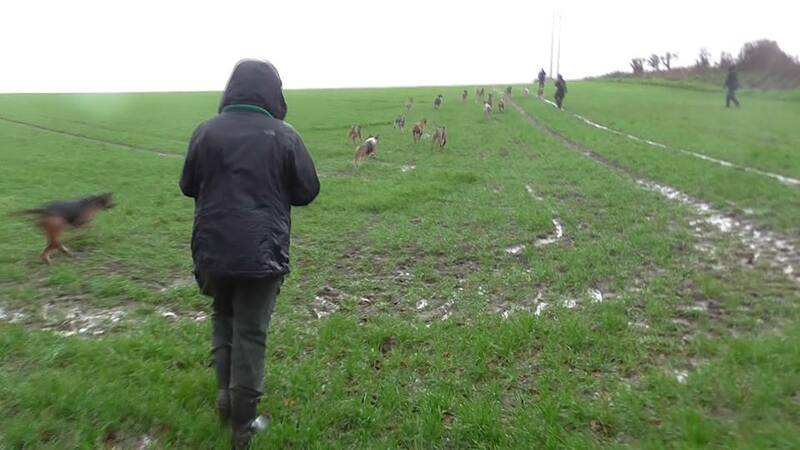 Near the end of the day, sabs came across the hounds who had just killed a fox. They were unable to save it as it was dead when they arrived, but they were able to get video footage and recover the body, which have been handed to police for investigation. The kill, combined with all their attempts at intimidation, serves as nothing but a reminder of why we do the things we do and puts the Meynell right in the spotlight for some extra attention. They should expect to see us very soon! As Feb 1st is the final day of the pheasant shooting season we thought we'd head out and see if we could ruin their end of season massacre. 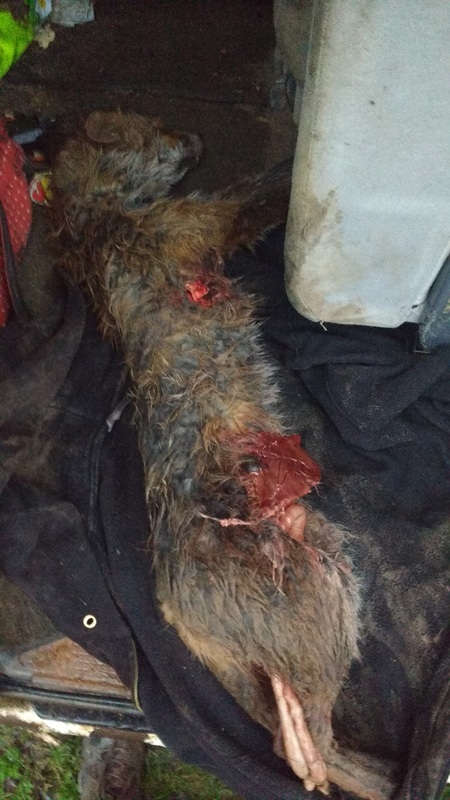 We quickly found a shoot on the Leics/Derbyshire border and sabs got straight into the field as the first shots rang out. The shooters quickly broke their guns and headed back to their vehicles. They tried to give us the run around for the next couple of hours but we stuck with them until we were happy they'd finished for the day before heading home happy we'd given plenty of pheasants a chance to survive over the summer. Today we joined up with Northants Hunt Saboteurs to visit the Belvoir Hunt who met at Waltham House, Waltham on the Wolds, Leicestershire. The Belvoir (Beaver to us common folk) are very elusive and haven't been properly visited by sabs for years. However since they were implicated in keeping captive foxes just before Christmas (http://www.league.org.uk/…/20…/december/the-disappearing-fox) we've been inundated with information about their activities so it seemed rude not to pop over and see them. Within five minutes of leaving the meet the hounds were chasing a fox (funny that with their liking for captive foxes) but Notts sabs were on hand to do enough to distract them. This seemed to put the hunt in their place and they were far more cautious for the rest of the day. Extremely cold wind made it a miserable day for many of the field, many of whom packed up at 2 but are hardy sabs stuck close to the huntsman and hounds throughout the afternoon and were happy to see them pack up just after 4 secure in the knowledge there had been no kills. All in all a very successful return visit to the Belvoir and we look forward to seeing them again in the near future. Great day out with with the Meynell today, who met at Woodhouse farm near Lees in Derbyshire. Between us and Derby they never escaped our sights. They were quiet for the first part of the day, but the last couple of hours picked up several scents and were covering loads of ground to chase them. Sabs were quick in pursuit and pulled them back, taking control of the hounds on a number of occasions at which point the whip complimented sabs on their horn skills, before saying "no comment" on the acting huntsman's ability. An active day but a complete result with no kills, the story would've been much different if it weren't for sabs! Yesterday was a hard but effective day with the Blenkney Hunt. They met in Coleby, Lincolnshire and were determined from the start. The hounds were out of control, chasing anything that they came across. This included a half mile chase with a deer, crossing a road in the process with all hunt staff far behind. It's only a matter of time until their poor hound control leads to a serious accident. 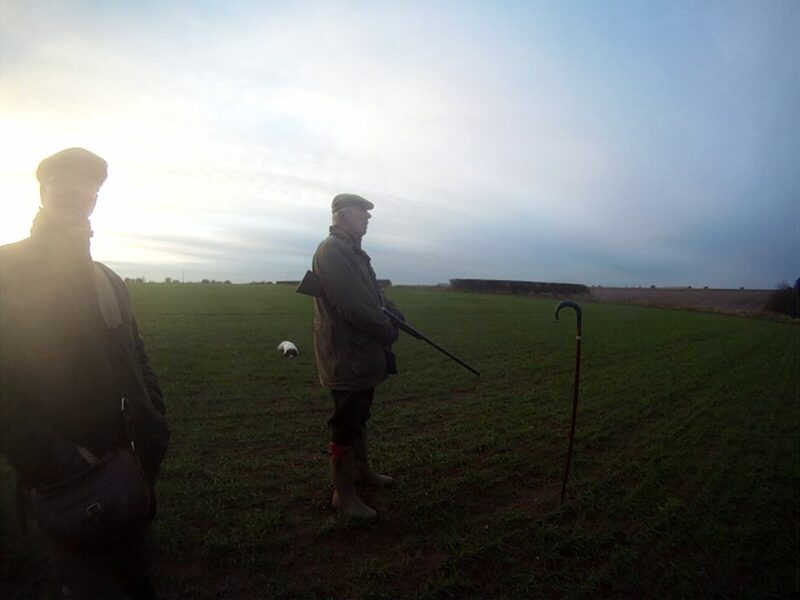 We spent the first couple of hours following and anticipating the hunt, as they zig zagged back and forth chasing scents that no sane-minded person could claim to be false trails, confirmed by the multiple foxes we saw to safety. Unfortunately, the Blenkney's croneys at Linconshire Police came along and decided to detain sabs for long periods of time and serve some illegal Section 35 Dispersal Orders. 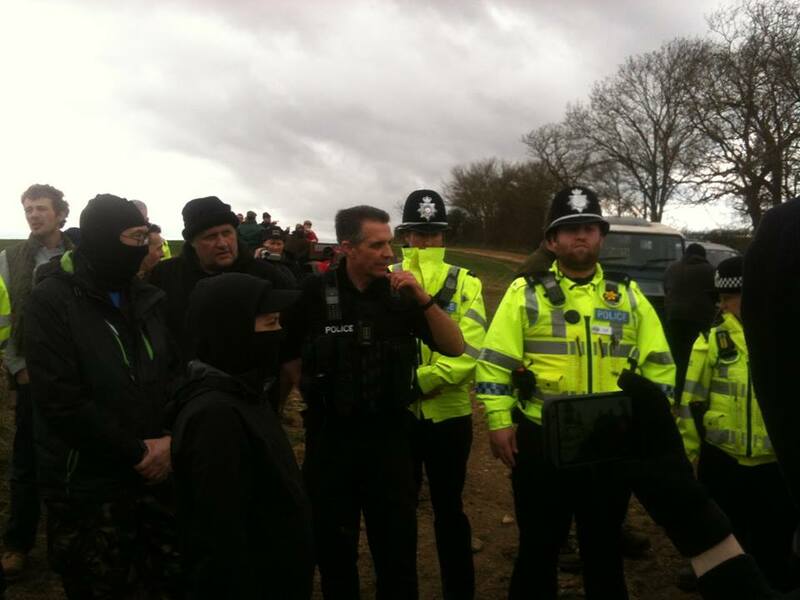 Sabs stayed in the area, but the polices tactics were enough for them to get away. All was not lost, as we stumbled across a large shoot in our search and were quickly in the fields to stop them shooting. They were reluctant, and some of them carried on shooting with us only meters away. It didn't last long, and after a bit of standing around they gathered up and went home, so we did the same. We plan to put in official complaints to Lincolnshire Police. Their facebook page is below if you'd like to let them know how you feel about your taxes being used to protect illegal hunting. Cottesmore huntsman Andrew Osborne was in a very grumpy mood today, in no small part thanks to us and Derby huntsabs turning up to a meet he was hosting at his very own house. He spent some time shouting angrily at hunt staff and support, but didn't let it get in the way of his ever determined and unsuccessful attempts at hunting. They spent a lot of the day traveling in circles going back and forth over the same area, in an attempt to find scents they'd lost earlier. This tactic might've worked if sabs weren't on hand to help the foxes to safety and cover their scents with citronella. Nothing short of a success! Due to vehicle problems today we joined up with Northants Hunt Saboteurs, North Cambs Hunt Sabs and Derby Huntsabs to visit the Oakley who were meeting near their kennels at Buscott's Lodge, Newton Bromswold. And what a damp, dismal welcome to 2016 it turned out to be. The hunt had little support out, and those who had bothered looked like they'd rather be elsewhere. The huntsman was also extremely lacklustre and didn't appear to be making much of an effort throughout the day. It wasn't a particularly easy day for sabs as the stewards were out in force but we're confident there were no kills and we had a far dryer and warmer day then the majority of the hunt. 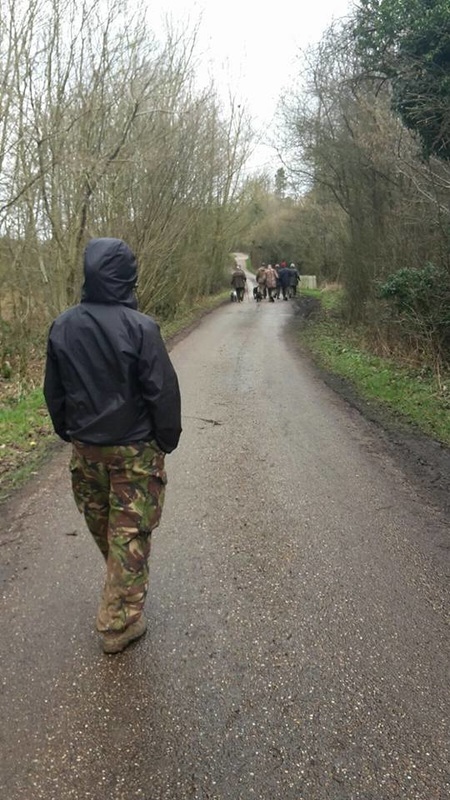 Today we teamed up with Sheffield Saboteurs and Derby Huntsabs to pay a visit to the Barlow hounds who were meeting in wet and windy Cuckney in North Nottinghamshire. They rarely hunt Saturdays so it was a treat for them to receive a visit from sabs (although they didn't seem that thrilled!). They met at their old kennels at the Rex Pet Hotel, this isn't in their territory but they obviously receive special permission from the Grove and Rufford to hunt here occasionally. They thought we had them confused with the Grove but we knew exactly who they were! 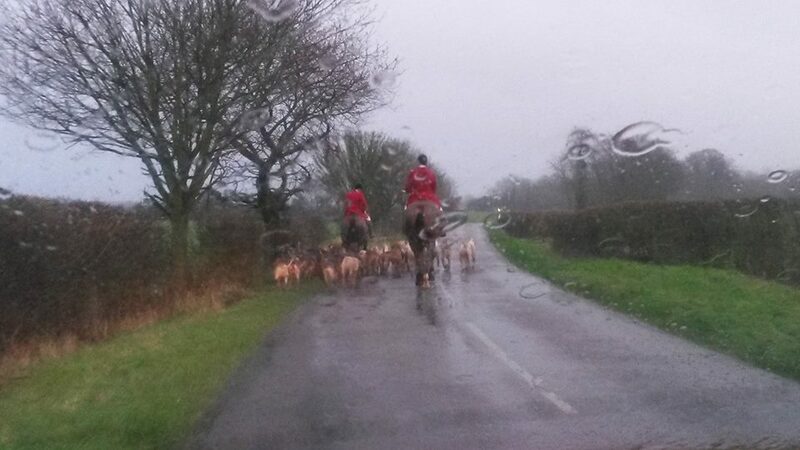 The weather was horrendous and the hunt really didn't look happy right from the off. 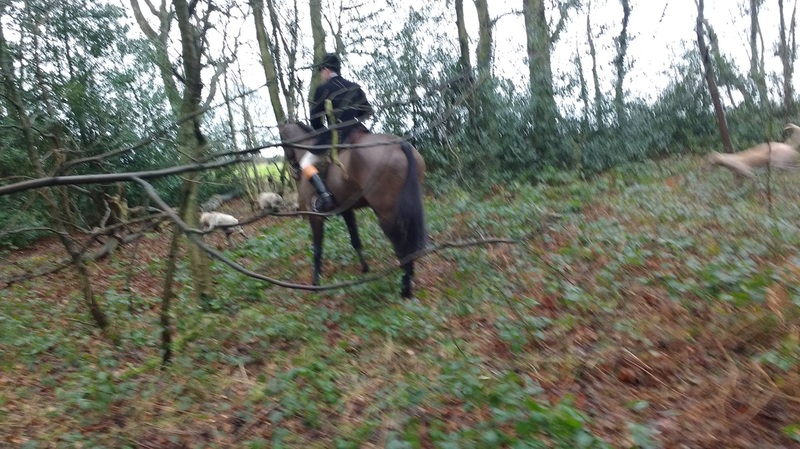 They rode dejectedly from covert to covert, followed by sabs, making little attempt to hunt. The huntsman tried to hide in some larger woods but we were still able to track them and when they picked up a scent sabs called the hounds out of the woods using a gizmo. And so their afternoon continued, closely followed by one or other of our groups of foot sabs. We lost them briefly but before long found them hunting one last covert back near the meet. Sabs pushed them out and they decided to call it a day and headed back into the meet. Please consider carefully next time you go on holiday whether you want to leave your pets at a pet hotel that hosts illegal hunting. If you don't then maybe the Rex Pet Hotel is best avoided. Easy day with Derby Huntsabs today. We arrived at the DNS - Derbyshire, Nottinghamshire, Staffordshire - beagles early and kept an eye well into the afternoon. 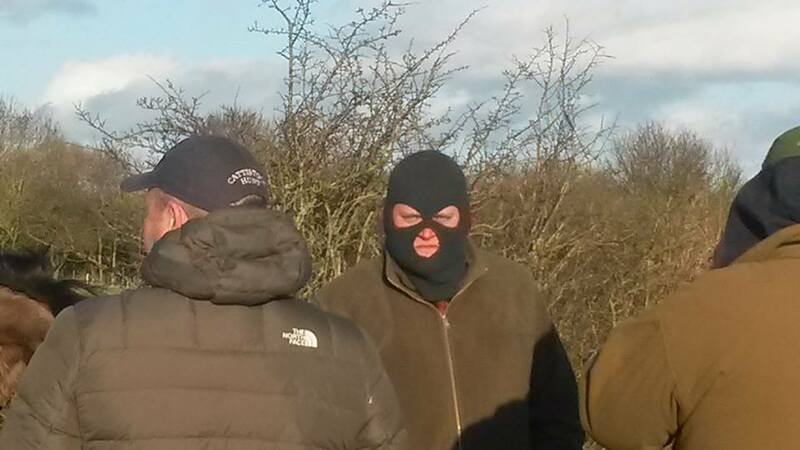 Despite some activity at the kennels, our presence deterred them from leaving and no hunting was done. No need to get wet, heating in the van, not even a chance of hunting. Perfect day sabbing! Today we met up with various other folk to again visit the Woodland Pytchley who were hunting just to the East of Market Harborough on the Leicestershire/Northamptonshire border. Sadly for us the meet was just on the Northants side of the border so we had to deal with the notoriously pro-hunt Northants cops who were out in force. 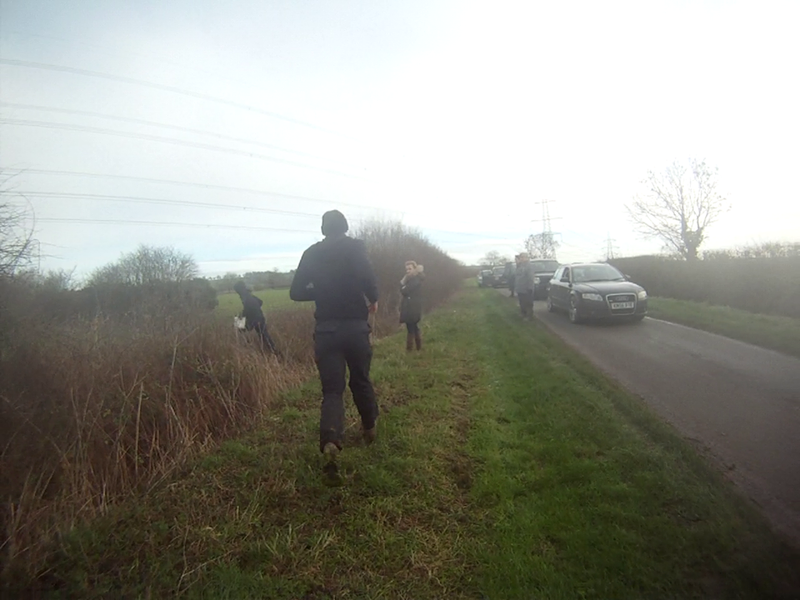 The hunt headed South from the meet and crossed the busy A6 and fannied about on a small piece of land between the A road and a railway line, closely monitored by foot sabs. The police had a laminated map of areas the hunt would be going during the day and as we managed to get a peek at this we had a fair idea where they would be heading. They crossed back over the A6 and into a wood from which a fox was seen escaping (according to some helpful passing motorists). As usual we had various vehicles of masked up goons trying to stop and intimidate us but they had very little impact today and sabs were rarely out of sight of the hunt. 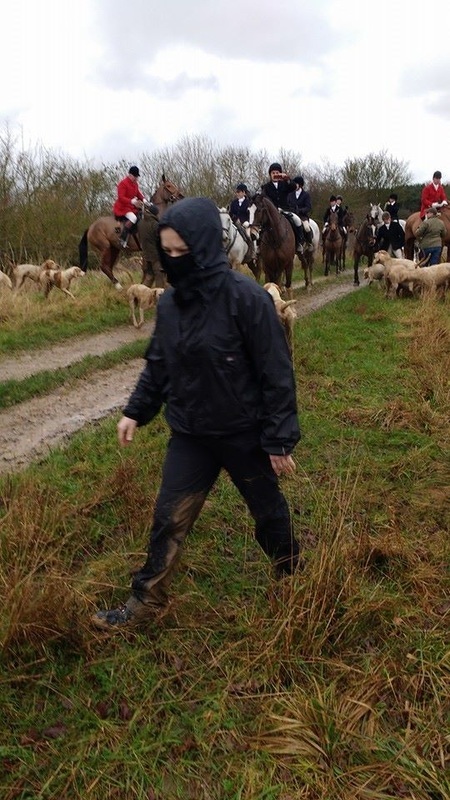 Several times during the day the hounds went on cry after a fox (despite the presence of their very earnest trail layer) but sabs were always on hand/ to help the fox to safety. The police were happy to act as private security and even stopped sabs from using public footpaths but we always found alternative routes and stayed with the hunt. They finally packed up at 5, long after most of the field had called it a day, and we were happy there had been no kills. Our season isn't quite over yet as the Woodland insist on hunting until after Easter but the end is in sight and Summer beckons! !